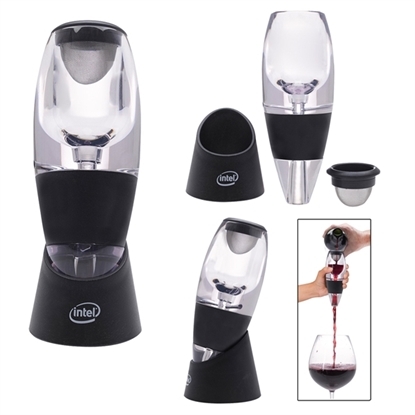 This red wine aerator is an item many of your customers could use at every function they host! It's made of ABS and silicone and the filter screen mixes the right amount of air for an enhanced flavor, smoother finish, and more liberated bouquet. This is designed to bring out the best in red varietals all in the time it takes to pour a glass. A no-drip stand is included and hand washing is recommended. Add a pad printed imprint of your logo to this item for a fantastic promotion! Mypromotionalpens.com offers the largest and best priced selection in Promotional Wine Accessories. We will price compete and we won't be under sold. Let our graphic designers make your personalized Wine Accessories standout above the crowd at no charge. We won't stop until you are completely satisfied with your custom Wine Accessories art proof.Use category search filters on your left to help narrow your search to find exactly what you are looking for.